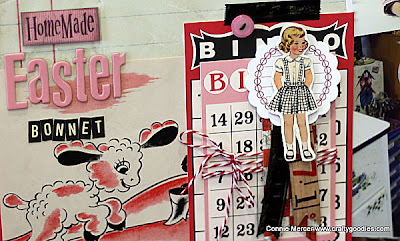 crafty goodies: Vintage Street Market ~ February's work!! Vintage Street Market ~ February's work!! Hi guys~I'm up over on Vintage Street Market's blog today. 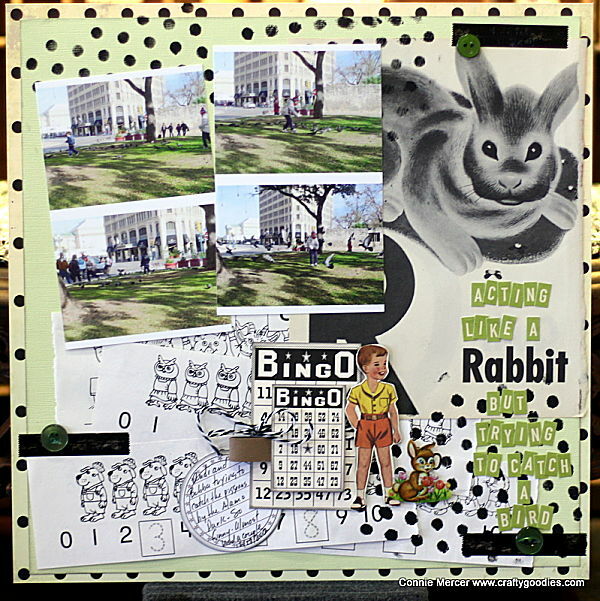 I did this layout using the Family Fun paper, Bingo Craft cards, Twirly Twine, Tinted Tape and ephemera!! All of these products can be found HERE. The cardstock is stamped using a stencil. The ephemera ( a page out of a children's work book) was cut in strips and layered on the cardstock, creating the background. Here is a sneak of the second one. I used the same supplies!!! You can go HERE to see the completed layout. Check out the weekly vintage deal ~ super cool! Lots of vintage goodies all in a kit, ready to create with and at a great price too!! I'm also up over on JBS today!! Big reveal day:):):) At the end of this week I will have my first post for Avocado Arts and Darkroom Door~excited about that!! Have a great Monday and I hope you can visit these sites !!! Try It Tuesday tomorrow!!! whoop!! You are busy, busy, busy, Connie! Love your wonderful creations! SUPER cute!!! This is awesome!! Look at you rockin them out!!! Love it! Adorable! Love that bunny rabbit too! Loveeeeeeeeee your lo!! LOVING that bunny and the fun title!!! off to see the other one!! 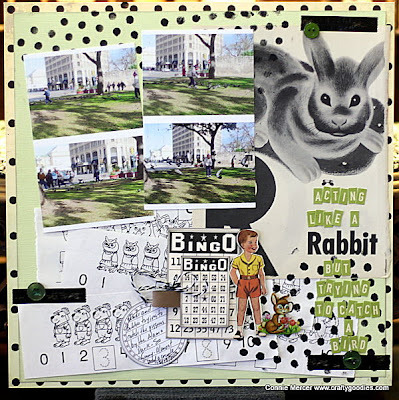 wow awesome layouts...i love that big rabbit...so cute....going to check out the other one.. Totally adore the bunny! Saw it on VSM! LOVE!!!! Such a beautiful page! Love looking at your vintage work! Way so sweet. I love it. All of the vintage elements are WONDERFUL!!! Try It Tuesday~re-purpose with JBS!!! Try it Tuesday~hymnal make over! Craft Crossing Class ~this Satuurday!!! I "heart" cookie cutters ~ many junkin' trips!!! Winter boy hair ~ with JBS!! !